Once again I received a review copy of a book from Packt Publishing. This time it was Mastering TypeScript by Nathan Rozentals. Its subject happened to relate to some new responsibilities I have at work recently, therefore I am now much more interested in it than I would have been in the past. I have mixed feelings about the custom frameworks developed throughout the book, implementing reflection, service locator and message bus functionalities. Although they have pedagogical value, they might be too tempting to use in own projects. In my opinion using these instead of maintained alternative open source libraries is not a good idea; and this isn't clearly communicated in the book. 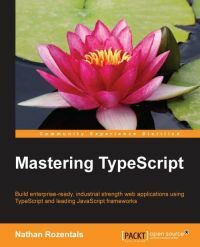 In spite of that I have no reservations about recommending the book to any existing or future TypeScript developer. It can serve as the first book to start learning the language, but can teach you a lot even if you have already been programming in it for a while. Some of the samples towards the end of the book can become quite complex, but if you read the whole book and occasionally look at the code downloads, you should still be able to follow them.